Mumbai: Handcrafted gold and diamond jewellery producer and exporter Shree Ganesh Jewellery House has formed a 50:50 joint venture with Italy’s SALP SPA to manufacture machine-made light-weight gold jewellery for the domestic wholesale market. Oroitalia Sales will be set up at SGJHL’s integrated jewellery manufacturing complex at Domjur in West Bengal, with an estimated investment of ₹ 100 crore. SGJHL, which had a turnover of ₹ 5,900 crore in FY11, expects the sales to increase by another ₹ 500 crore after the JV becomes operational, Parekh said. “The unit is expected to be operational by first quarter 2012-13, with an initial capacity to manufacture 10 tonnes of light-weight gold jewellery, particularly gold chains, annually," he said. Under the JV, SGJHL will provide the infrastructure, while SALP will give technical expertise. 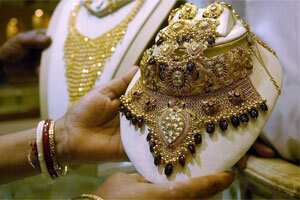 Parekh added that the jewellery is targeted at the young crowd who prefer light jewellery. He stated that of the estimated ₹ 2,50,000 crore domestic jewellery market in the country, light weight jewellery accounts for ₹ 50,000 crore.